Desmond Child's big-budget production makes the Scorpions' 21st full-length sound noisier and more vigorous than most musicians their age... but the music doesn't do anything much but flounder. Taking a look back on the extensive musical activities of the Scorpions, it seems like a miracle that they’re both Germany’s most successful music export to date and have survived to see the arrival of the noughties and the fourth decade of their career. Humanity – Hour 1, their 21st record, comes 35 years after their first -- the fivepiece are truly one of those bands that seem neither historically important or relevant anymore, but have still 75 million sold copies of their music worldwide. If anyone can actually remember what these beer-drinking hard-rockers sounded like way back on 1972’s Lonesome Crow, by the way, count yourself officially in the know. More often than not, however, an outfit that suddenly turns to humanism, for no visible reason other than it stirs the public into believing they have a gnawing social conscience, generates the inevitable ringing of alarm bells. It’s been a gruelling challenge in even the most elite of band’s annals to strike the ideal balance between music and a lyrical tirade which is neither preachy nor soppy: even more difficult when the members involved are some sixty years old. Alas, the Scorpions of 2007 fail to heed the overwhelming evidence in this regard and instead dive face-first right into an ambiguous concept disc about humanity and all its downfalls on Humanity – Hour 1. Admirable attitude, guys, but telltale signs are popping up everywhere that you’re getting too old to rock. Then again, maybe that’s giving them too much credit; veterans they may be, but there’s nary so much as a nod of acknowledgement to whoever they think they’re playing to on Humanity for sitting through their unimaginative indulgence. They of all people should know that actual music has always gone hand in hand with all the great concept discs, and they sound like they had so much fun writing the songs in the garage and pretending to be young again that they forgot to include anything to back their very roundabout message up with. 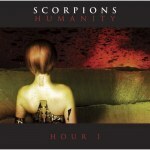 If there’s one looming, undeniable fact that really punches its way home on the back of the bloated, crashing production of Humanity - Hour 1, though, it’s that, it’s that the Scorpions know their strengths. They’ve outgunned all the trends that have swelled and then fallen by the wayside over the countless years by determinedly sticking to what they play (and know) best. Despite the fact that American producer Desmond Child takes the helm with cringe-worthy attempts to ‘update’ their sound to renew their early ‘90s commercial success, a revved-up, bombastic cheese-rock parade is the record’s dominant force from the moment an emotionless female voice intonates “Welcome to humanity – this is hour one” at the get-go. Vocalist Klaus Meine’s trebly tenor sounds fine considering his age, and he hasn’t lost his German accent over the years, something that lends unintentional humor to the album’s big, swoony hooks, especially the bland and poorly-written ones: “In the game of life / We live and die”, he announces straight-faced on “The Game of Life”. “You’re Lovin’ Me to Death” and “321” are the hardest to stomach of this bunch, standard plod-rock fodder with lifeless nu-metal guitar overtones which deaden them further, and choruses that would have been acceptable in the ‘60s, but certainly not today. “Save me / Cause the world’s gonna’ stop / 3, 2, 1, are you ready to rock?” Gags. Humanity also has its share of dull-as-dishwater power ballads that are as textureless as they are lovelorn, but the album’s standard starts to lift near the end. “Your Last Song” and “Love Is War” bring out the acoustics and have a natural (note: not contrived) flow to them, yet the production is so typically overblown they overleap the desired effect. “The Cross” features Billy Corgan’s sneering guest vocals, a track whose religious metaphor (“For the demons in my head / I’ll nail you to the cross”) at least makes for some stronger songwriting, but his appearance is only brief, and could have been put to much better use in a duet-style song with Meine. “We Will Rise Again” is an uneasy, turbulent number, and first single “Humanity” is shelved till last, unusual since it’s a virtual rewrite of “Still Loving You” that houses the most memorability on the disc, and fails to wrap it up as anything other than a funny footnote. The Scorpions have launched their own mini-Year Zero scheme in the name of promoting Humanity – Hour 1: the band’s website boasts the female android from the cover art in interactive form. It’s a much more entertaining experience to chat with an internet bot than listen to the record at some points, as each spin is as faceless as the other. But if Humanity is an unremarkable album in itself, complete with a frankly laughable social slant, the band sound more confident stuck to their hammy hard-rock than anywhere else. They’re well past their prime, after all, and even if not a soul takes any notice of Hour 1, it reassuringly trumpets to us the fact that the Scorpions understand the Scorpions.